Two years ago, my friend Edith gave me a book. Published by Lippincott, it was bound in the sand-colored fiber-over-cardboard of old library books and had a fraying dust jacket. 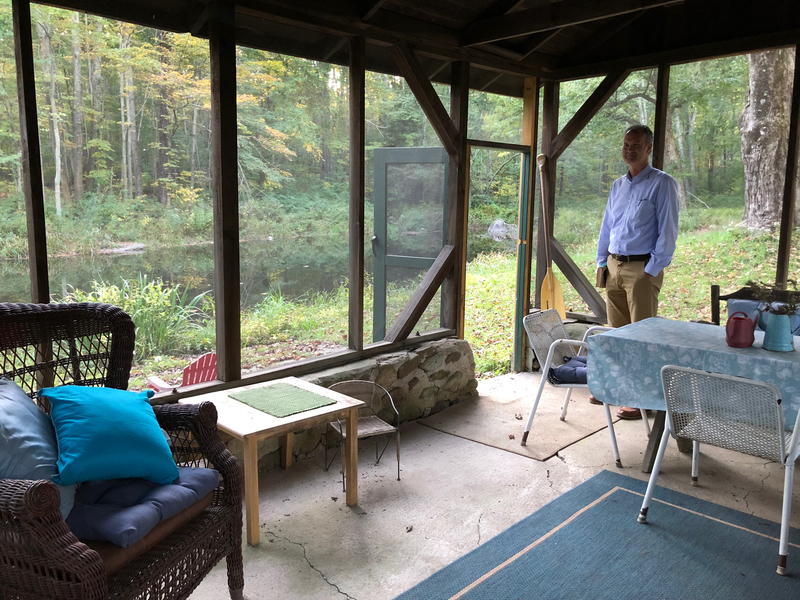 Something about ‘Stillmeadow,’ written by a woman named Gladys. I opened that book on a Sunday afternoon, and . . . fell in. You can Google Gladys Taber on your own for a biographical sketch. I have other ways to describe her. She looked and listened and noticed and was humble. She had opinions and loves and worries and wrote about them poignantly. My favorites of her books go month by month, and pierce each month to its essence. She got April, and October, and even August and February which don’t have a lot going for them. 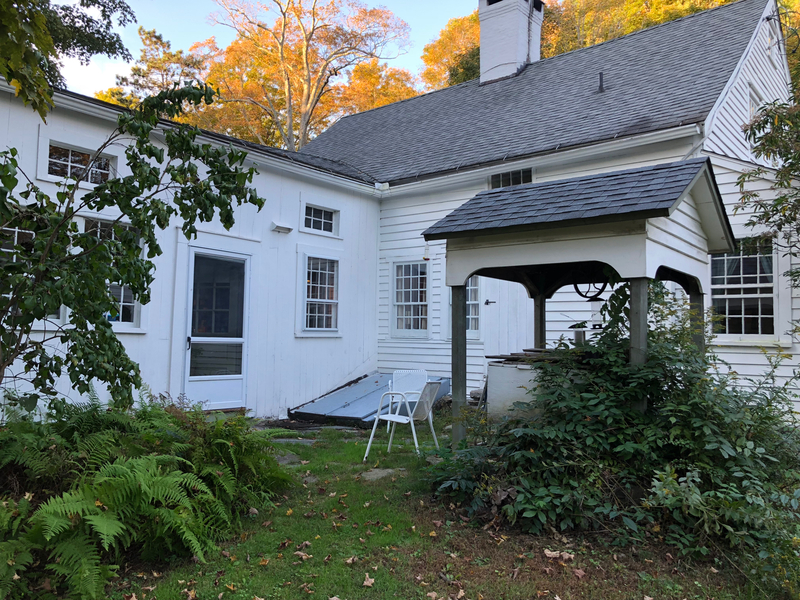 Stillmeadow is a place, a real place, in Connecticut. 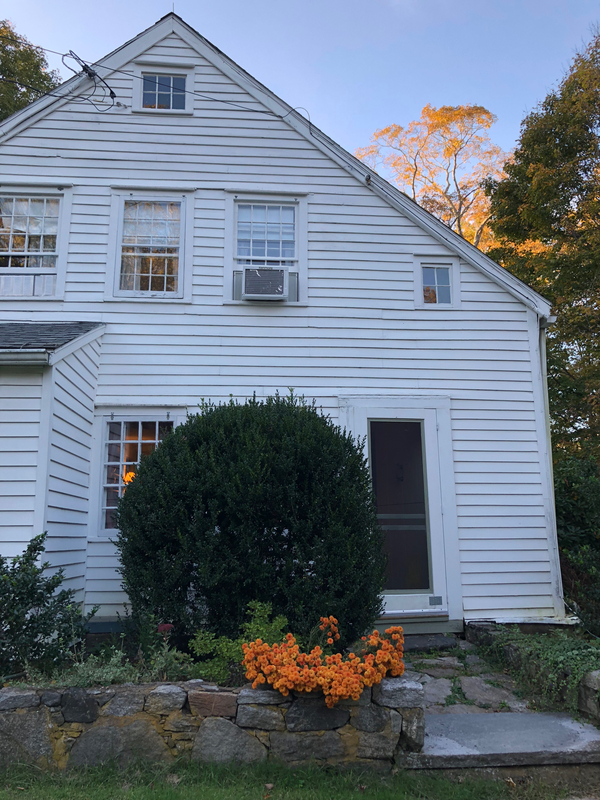 It is a farmhouse first built in 1690 that Gladys and her family bought in the mid-1900s and still belong to. It is 40 acres, more or less, surrounding the house that whisper of the pleasures and the aches of all who have called it home over 300 years. 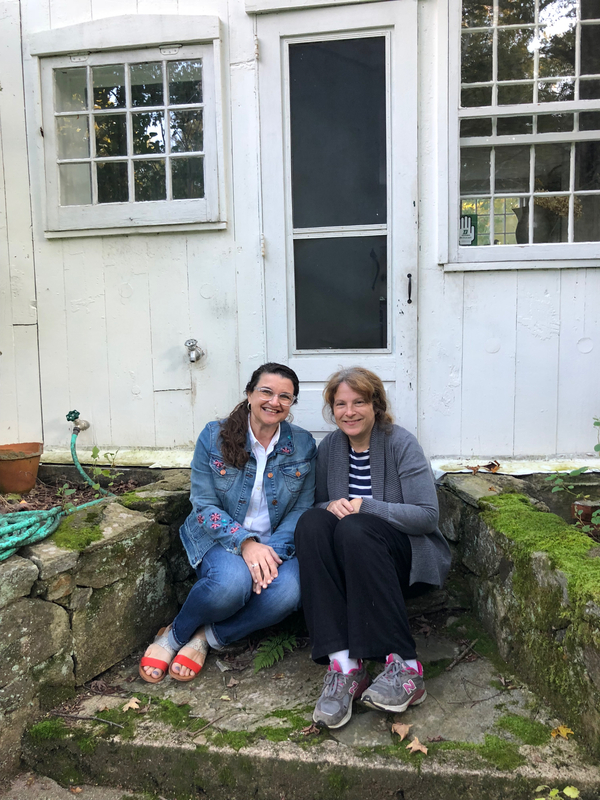 I had the blessing of meeting Gladys’s granddaughter Anne Colby and seeing with my own eyes this place that Gladys considered entrusted to her for a season of its life. I understand the term ‘living history’ a little better now. And I thank Anne for sharing this treasure with me. Stillmeadow is more than a house and acreage though. According to Anne, what Gladys was offering her readers was the chance to find Stillmeadow in their own home. Anne and I sit on the step outside the back kitchen. I picture Gladys peeling her potatoes here and pondering life and dogs and such, while Jill, of course, bent over her garden. Welcome! The wrought iron Cocker Spaniel that often appears in illustrations here at the gate once topped a tall post, but Anne says ‘Gram’ did not replace it after it was stolen a second time. There is a wrought iron cocker bootscrape inside the house to keep a cocker presence in the house currently ruled by cats. The gate and fence, facing Sanford Rd, off the Jeremy Swamp Road, were damaged by a tornado back in May. 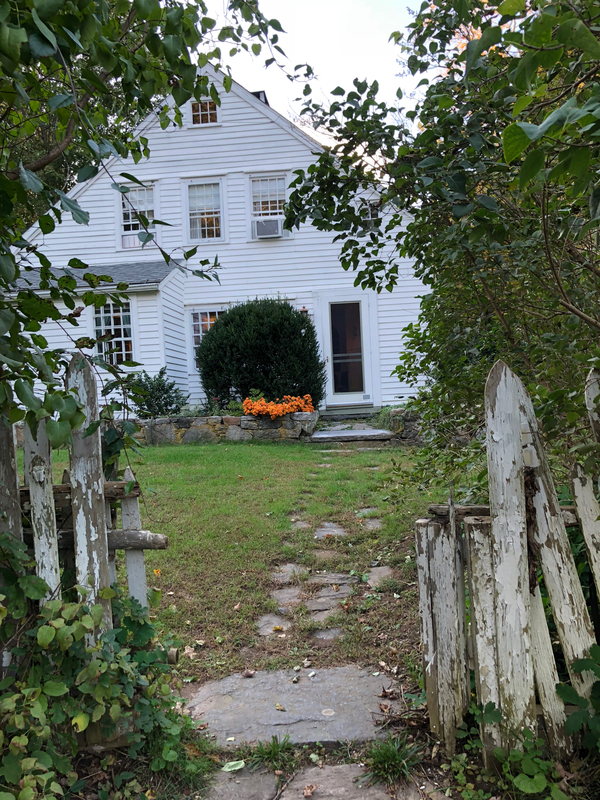 This is Gladys’s front door, though in earlier days the front door would have been on the right side of the house, just behind that tall bush. She watched the changing world from here. Yes. You are right. This is the Quiet Garden. It also suffered in the May tornado. 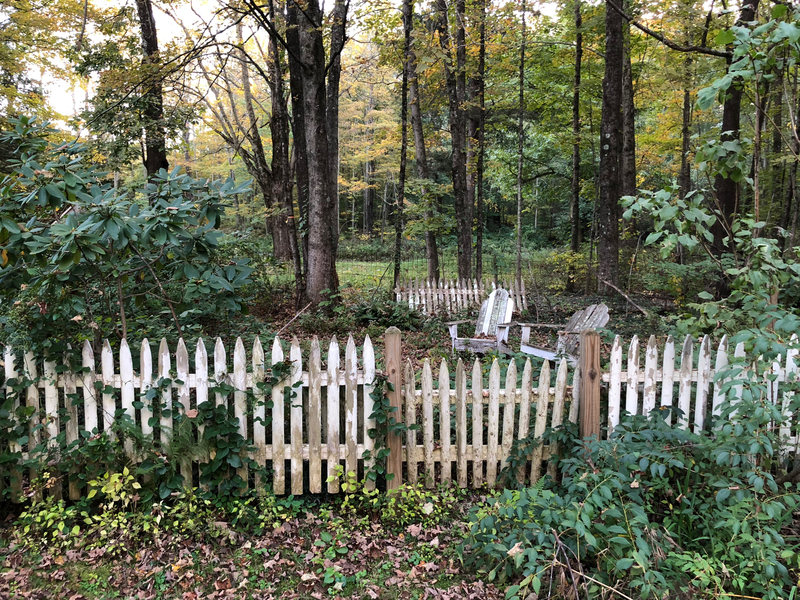 It is behind the house and to the left if you walk out the back door. Tucked back to the right of this picture, in the woods, is the last of the kennels used for the cockers, used by an earlier owner for pheasants. Even though the Quiet Garden is grown up and leaf strewn, you can still see the outline of the flower beds. I picture Gladys there on a chilly March day, insisting it is warm enough to eat outside. Jill would have been skeptical, but let Gladys follow her impulse. In Spring, does lavender still come up between the flagstones? Let’s walk down to the pond. Just behind the Quiet Garden, Anne Colby and my husband Andrew stand where Jill’s garden was. Anne remembers it as very open and sunny then in that patch. 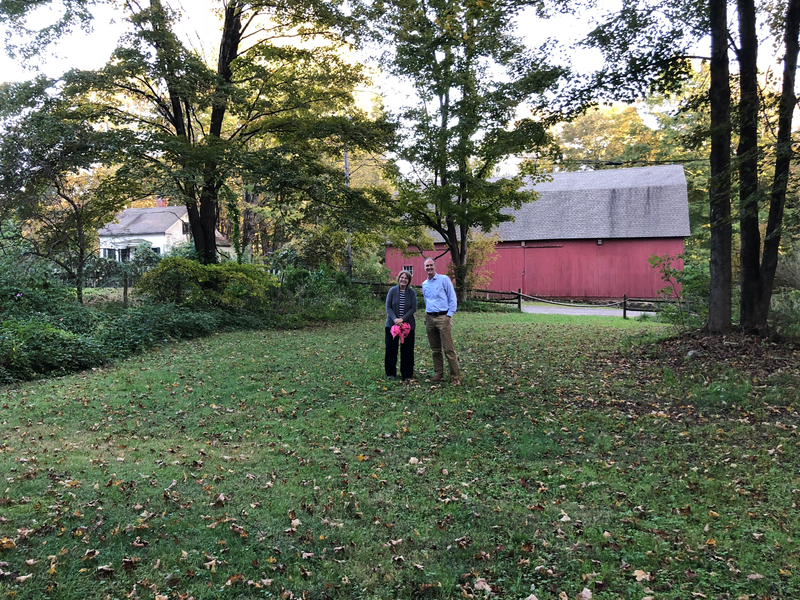 Behind them is George’s barn and house. 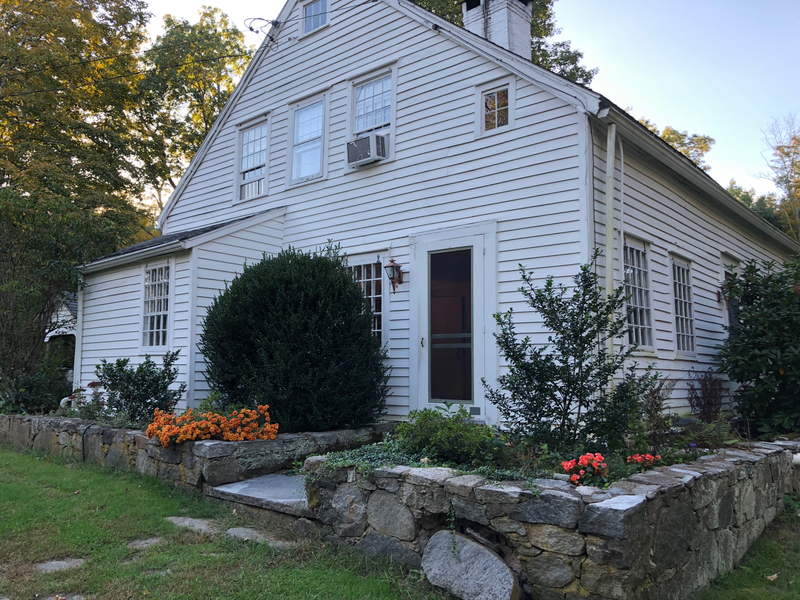 George’s house was originally built for the daughter of an earlier family at Stillmeadow when she married. Anne recalled George’s cows getting out of his barn one time and trapping her in the little house by the pond. 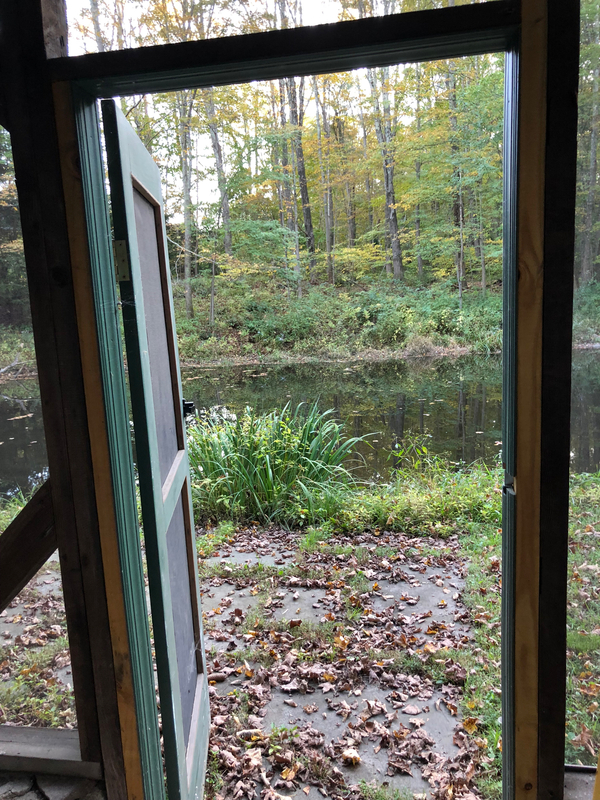 The little house by the pond. Smiley Burnette built the ‘barbecue’ close by. We did not see Gladys’s unicorn. But surely he comes, as Gladys imagined, and crops the small greenery on the pond’s far side. 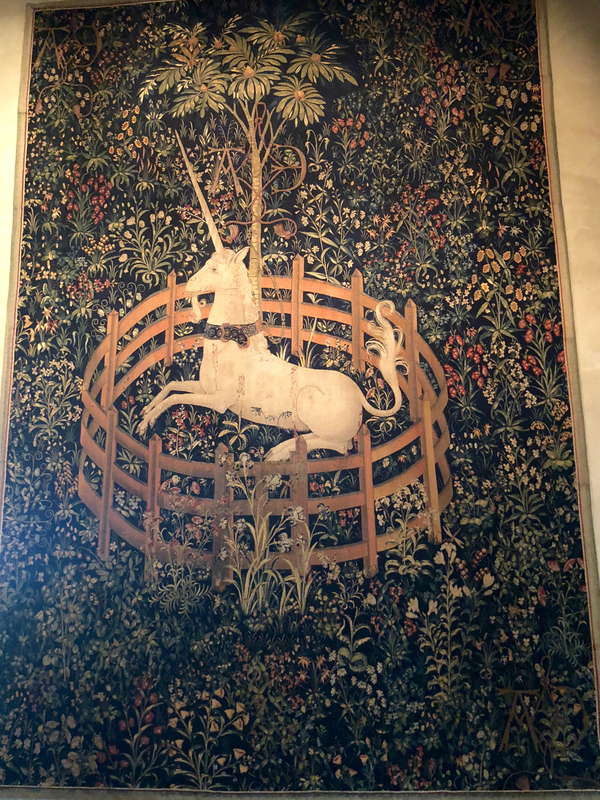 Incidentally, we went to The Cloisters in NYC and saw the unicorn tapestries that Gladys found mesmerizing. I understand why. This one is framed on the wall upstairs in one of the children’s bedrooms. 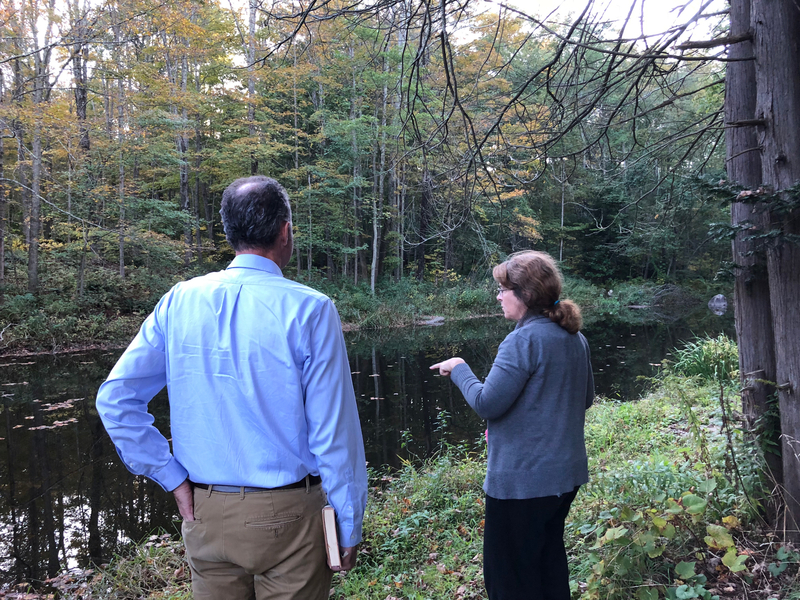 Anne explains her work in applying for and receiving ‘protected land’ status for Stillmeadow and a corridor of several surrounding farms. It is a huge undertaking, but she sees progress! But you want to go inside, don’t you? 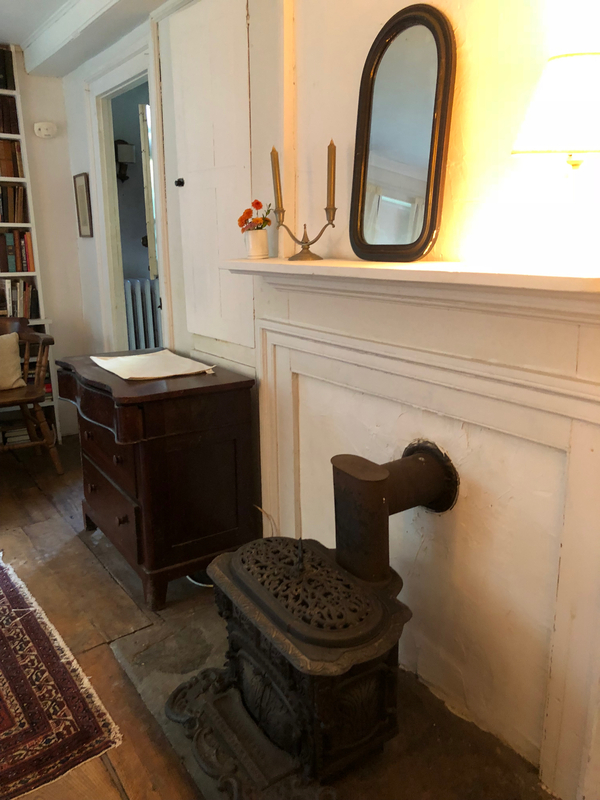 Here is her fireplace that was wretched and sagging when she first saw it on that cold day. Anne showed us how the dogs left footprints in the concrete between the hearth stones during those early repairs. One footprint was big enough to be Holly’s. Of course, I pictured the cat and dogs that slept practically in the fire, like salamanders, as Gladys said. And yes, the ceilings are that low, lower than I had imagined. 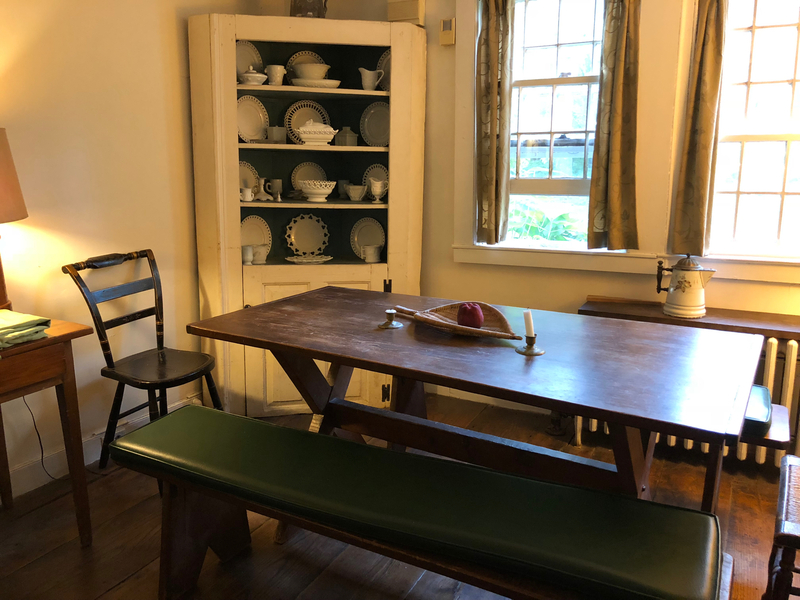 Jill’s trestle table and the milk glass! 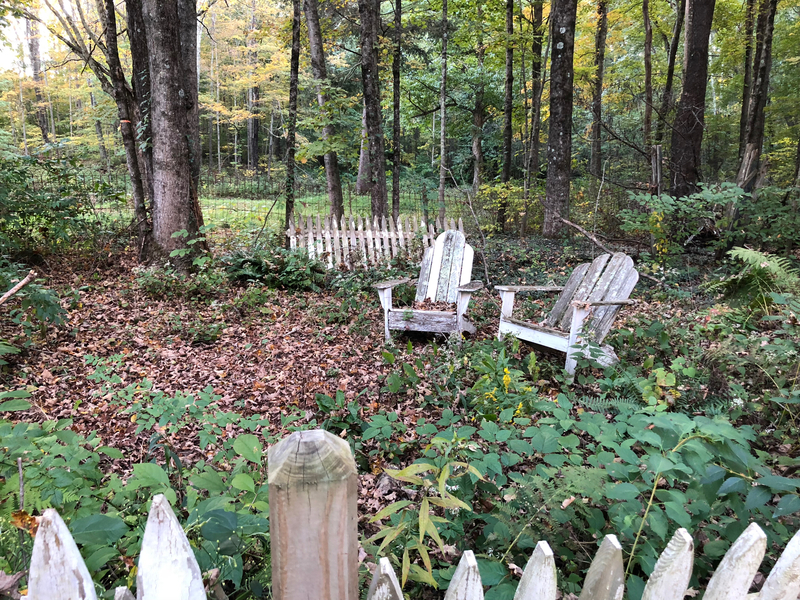 That chair to the left was refurbished by Gladys’s husband Frank who turned to woodwork and other pursuits with his hands after his music and teaching career ended early due to illness. Anne said that Frank did wonderful furniture restoration work. 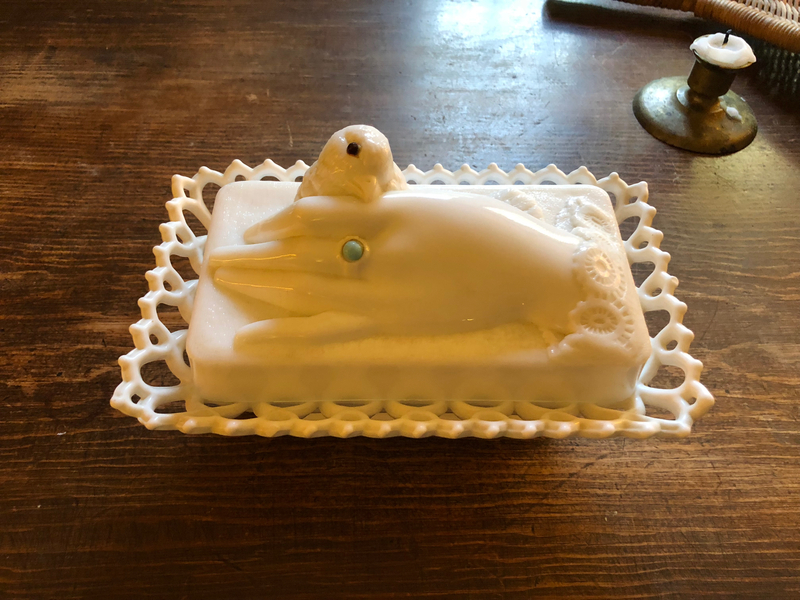 The swan compote and the lady’s hand dish, Gladys’s favorites. Remember how she loved the stone in the lady’s ring and marveled that it was still there? That is a bird’s head resting on the lady’s forefinger. 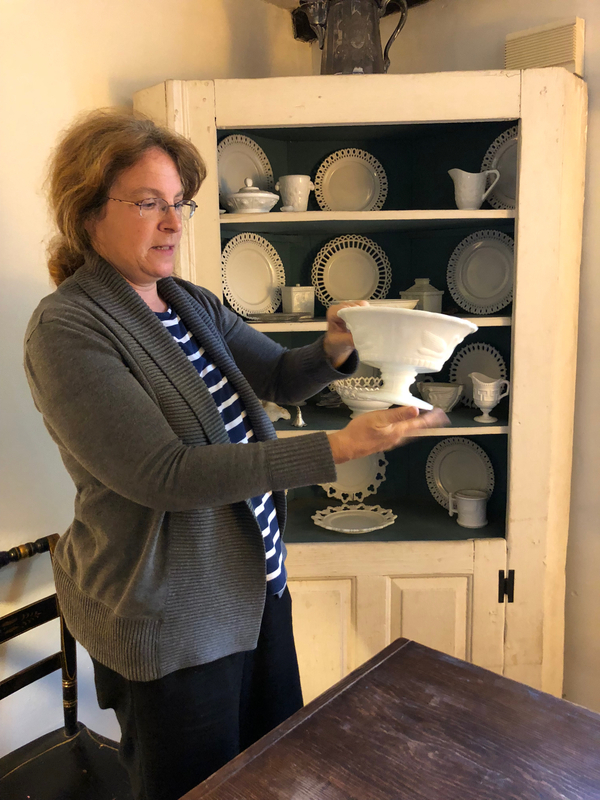 Anne shows the irregularities in the swan compote that are the hallmark of hand-made things. Ladies Home Journal redid Gladys’s kitchen at one point when vinyl on the walls was all the rage. 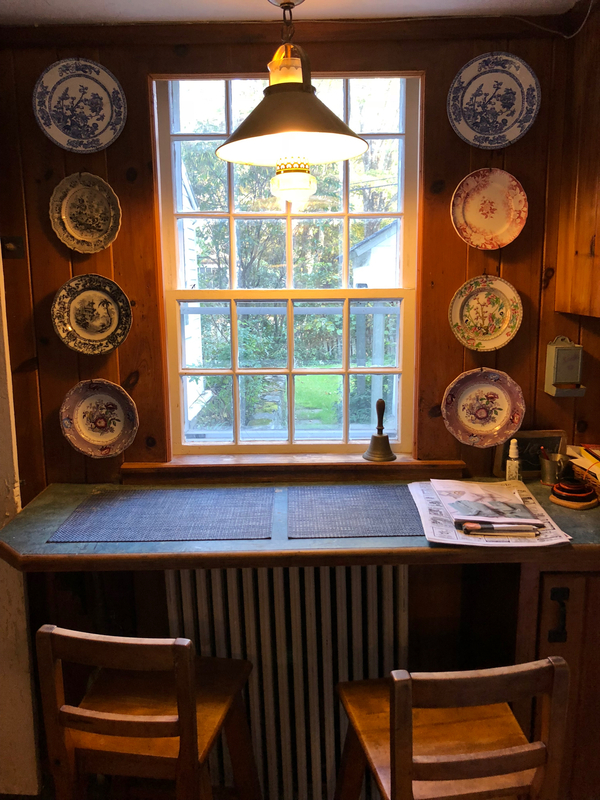 Now, Anne has been told that if she updates anything she cannot take the blue vinyl off the wall above the stove and behind the blue plates because it is so of-an-era. 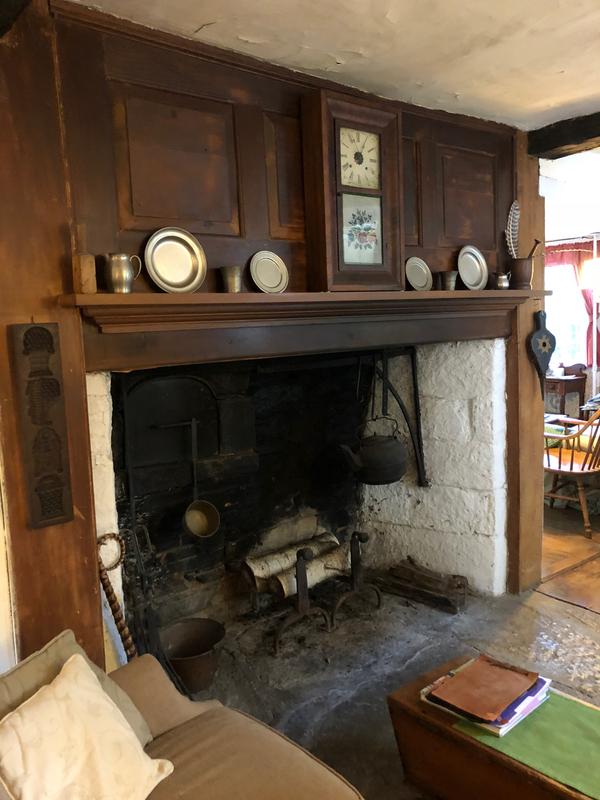 This stove saw many a soup for guests and dogs, stirred with the old wooden spoon she loved. 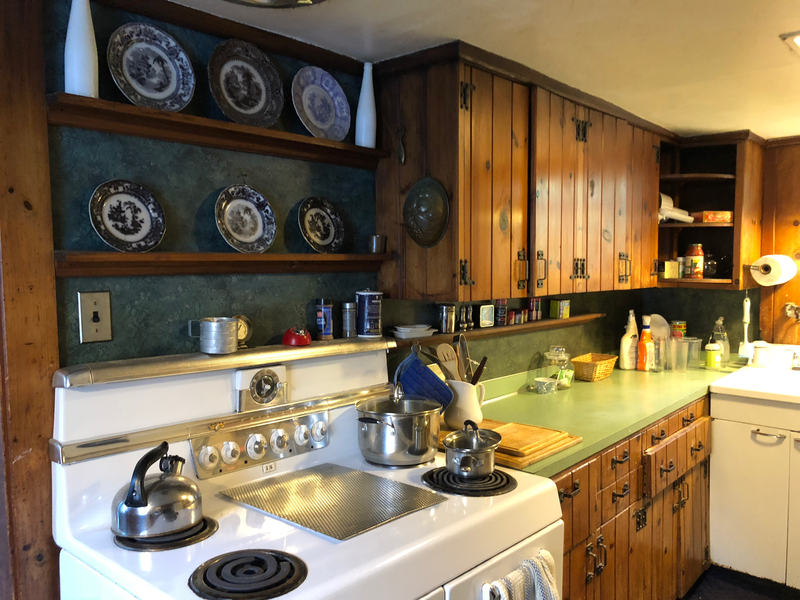 This kitchen saw Connie, Don, and Barbara grow up; it saw the mid-winter picnic; the visiting tenor; Gladys’s overzealous pepper purchase that had them chopping and canning pepper jellies for days. And I can’t help thinking of Gladys standing here for the first time after Jill passed away so suddenly. That shocking road we all eventually walk, Gladys dealt with here in this kitchen where for so long she and Jill had agreed on grilled-cheese and a linen-closet clean out. Gladys’s bedroom. 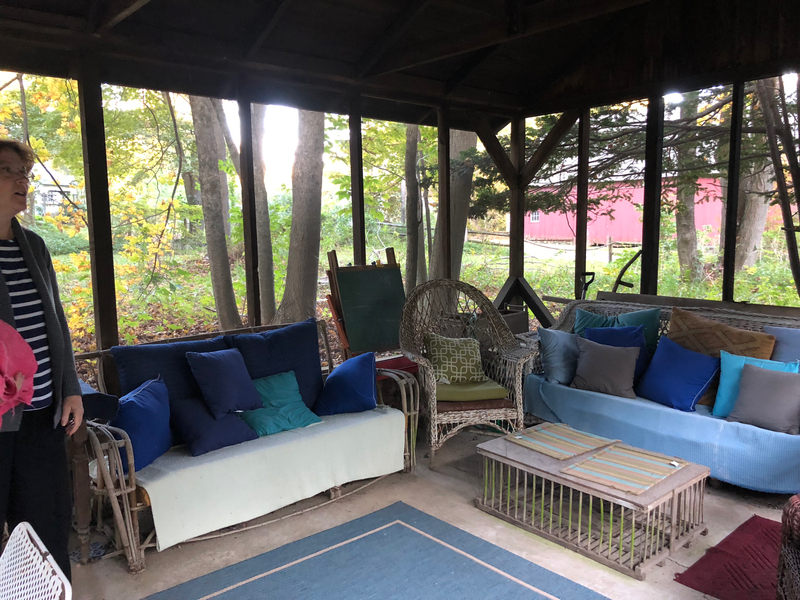 Her desk was where the blue bed stands now and most of her writing was done right there, looking out that window at her bird feeders. Remember the brave chickadee with the bent wing? The love seat was right beside the desk, Holly’s perch and Honey’s. Anne said that Gladys worked diligently, writing every day at her desk. The blue bed has its own special meaning. It has been Connie’s bed for a while. 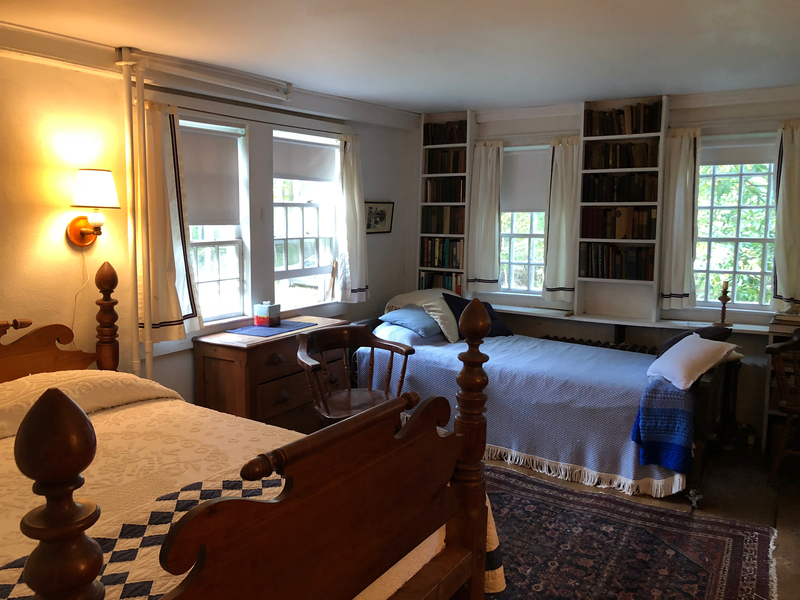 Connie, the Columbia doctoral candidate who typed at least part of her thesis here at Stillmeadow, is 91 now, and spent much time in this bedroom. And Gladys’s desk is now in Jill’s small bedroom. Gladys’s bedroom was so much larger. But Jill was a no-nonsense New England woman, and after all, her ‘office’ was outside in her garden. 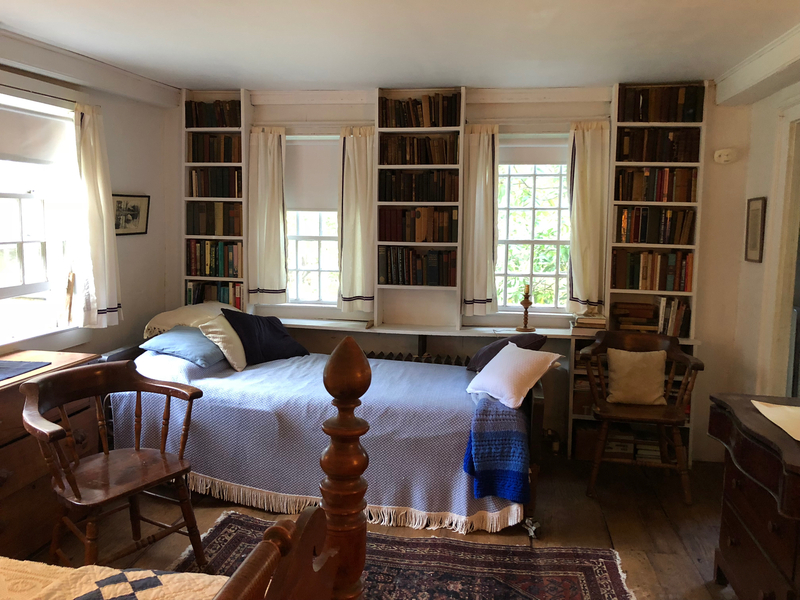 At that desk, Gladys wrote, Connie wrote, and now Anne has written. It is an old green metal desk that has seen much fruit. Gladys’s stove. The door leads to what used to be the foyer and front door of the house. Remember how Gladys said she loved that her bedroom was, for a time, where worship services were held. Finally, this is me sitting in Gladys’s favorite chair. Anne said that though Gladys did not put it in her books, she was in lots of pain in her later years. 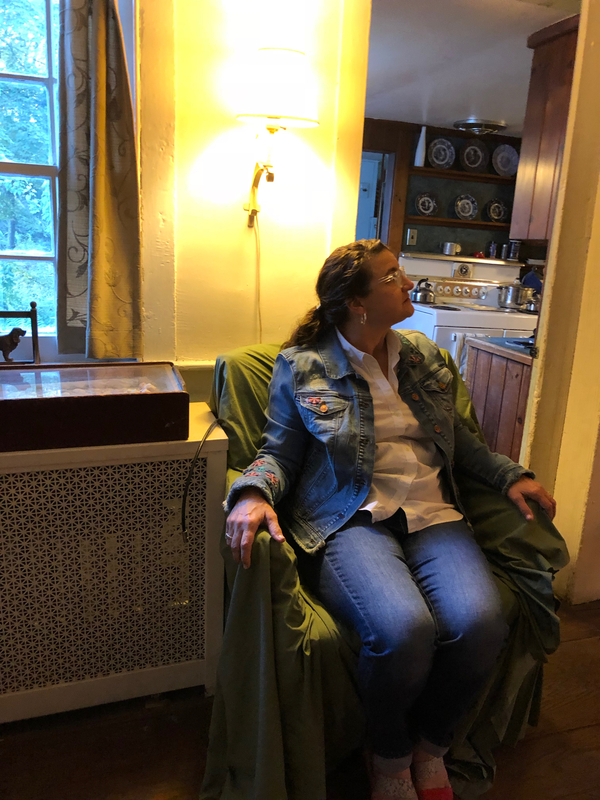 I sat in this chair and reflected that Gladys was an amazing woman. You can see just the head of the wrought iron Cocker Spaniel bootscrape in the windowsill behind me. There is so much more that could be said about Gladys Taber. I write all this to give God the glory for a talented woman who saw beauty and worth in this world and shared it openly with us. And I thank Edith Whitehead who gave me my first Gladys Taber book. Well Written. Keep going ! !